Bomb robots were designed to help detonate and remove Improvised Explosive Devices (IEDs), not to deliver payloads. But the Dallas police improvised and attached a bomb delivery system to the robot. In part four of the ABC of RPA series, we discuss how to choose the right software to suit your automation requirements. CADE METZ for WIRED: HANNS TAPPEINER TYPES a few lines of code into his laptop and hits “return.” A tiny robot sits beside the laptop, looking like one of those anthropomorphic automobiles that show up in Pixar’s Cars movies. Almost instantly, it wakes up, rolls down the table, and counts to four. Standardizing Collaborative Robots: What is ISO/TS 15066? Samuel Bouchard for Engineering.com: Collaborative robots (also known as cobots) are changing how robots and humans interact in our factories and manufacturing facilities. No longer separated by cages, humans and cobots can work beside each other on complex tasks from picking and placement to assembly and logistics. igus® Robolink: Articulated joint modules for robots. Lightweight. Compact. 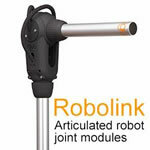 Robolink: Articulated joint modules for robots. igus® now offers a lightweight, maintenance- and corrosion-free range of robot joints for humanoid systems or other automated applications. The carbon-fiber plastic joints can rotate and oscillate freely via four wire ropes. No more expensive milling, cutting or DIY systems. Moving mass is reduced to a minimum. The actuators (engines, pneumatics and hydraulics) and the control module (DP, PC) are kept separate. Contact igus® for more information and free samples. SCHUNK is a family owned operation and a global player in one. Totaling more than 60 years of experience, SCHUNK offers worldwide leading technology in gripping systems and clamping technology. With more than 2,000 employees located in more than 50 countries in a network of directly owned subsidiaries, SCHUNK offers global customer service and technical support. SCHUNK designs and manufactures an unmatched selection of gripping systems including grippers, rotary modules, linear modules, robotic components, sensors and accessories. RoboticsTomorrow is a community website where those of you who work in the Robotics, Automation and Advanced Manufacturing Industries are invited to contribute articles, news and product information for your peers to read and discover. Our philosophy is to create an outlet where the industry can report on itself.